Diablo magazine’s July issue features the 2018 Best of the East Bay winners, as selected by Diablo readers. This year’s Best of the East Bay issue boasts nine categories and 100 winners. The categories include arts and leisure, beauty, fitness, food, kids, nightlife, pets, shops and services, and weddings. 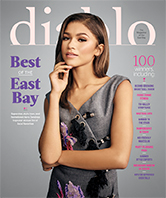 Each spring, Diablo readers are asked to vote for their favorite East Bay businesses, restaurants, shops, gyms, and more. After the votes are tallied, the businesses with the highest number of votes are then featured in the July issue of Diablo magazine, which is the most popular issue of the year and is available throughout the San Francisco East Bay and online at diablomag.com. More than 54,300 votes, which were submitted by Diablo readers, determined this year’s winners. View the complete list of 2018 Best of the East Bay winners here. Covering topics ranging from travel, culture, and personalities to entertainment, recreation, and food, Diablo magazine is written specifically for the San Francisco East Bay market—from Central Contra Costa, into the Oakland and Berkeley hills, and throughout the Tri-Valley. With locally driven editorial content, beautiful photography, and resource listings, Diablo magazine is a unique celebration of the San Francisco East Bay. Published since 1979, Diablo magazine has been recognized for its editorial and design with numerous awards, including previous Maggie Awards for Best Overall Publication and Best Regional and State Magazine in the consumer category. For over 39 years, Diablo Publications, an employee-owned company, has been creating award-winning publications, including Diablo magazine, Napa Sonoma magazine, Diablo Weddings, Diablo Arts, Concierge Wine Country, and the Tri-Valley California Visitors Guide. Diablo Publications’ custom content division, Diablo Custom Publishing (DCP), provides complete print and online marketing communications and customer publishing services for corporate clients nationwide. For more information visit diablomag.com to view our retail publications and dcpubs.com to learn more about custom publishing.